Diane Marks started her writing career in 2010 and has been in health care administration for more than 30 years. She holds a registered nurse license from Citizens General Hospital School of Nursing, a Bachelor of Arts in health care education from California University of Pennsylvania and a Master of Science in health administration from the University of Pittsburgh. The most common foods that can cause a metal taste in your mouth with nausea after eating include nuts, peanuts, wheat, eggs, soy, fish and milk, according to FamilyDoctor.org. These symptoms are related to a food allergy that can cause additional symptoms after consuming a food that you're allergic to. Although these symptoms are related to the digestive system, you may also develop symptoms in your respiratory system, skin and cardiovascular system. Make an appointment with your doctor for further evaluation. A metal taste in your mouth and nausea after eating will develop within a few minutes after you eat an allergen. The digestive system is one of the first systems in your body to react to a food allergy. These symptoms are caused by inflammation throughout the intestines and gastrointestinal tract. Inflammation is the result of various chemicals produced during the allergic reaction, such as histamine and antibodies, according to MayoClinic.com. Food allergy symptoms are caused by the immune system and are not a digestive disorder. Your immune system protects the body from infection, illness and disease by fighting off harmful substances. Eating a food that you're allergic to can cause your immune system to overreact to the proteins found in the food, according to MedlinePlus. For example, if you eat peanuts, the immune system mistakes the peanut proteins as a dangerous substance and attacks it with various chemicals. These chemicals cause irritation and inflammation in the body. Once you've ingested a food or beverage that you're allergic to, you cannot treat the symptoms. You will have to wait for the body to expel the allergen before symptoms will subside. 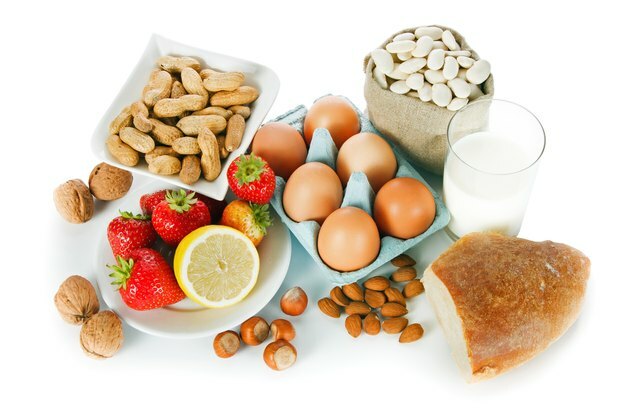 The most effective treatment for a food allergy is to identify and avoid the foods that are causing the symptoms. A small amount of the allergen can trigger your symptoms. You need to familiarize yourself with common hidden ingredients in foods and read all package labels before consuming a product. A genuine food allergy will cause more symptoms to develop than just a metallic taste in your mouth and nausea. Other digestive symptoms may include vomiting, cramping, stomach pain and diarrhea. Your respiratory system can develop symptoms, such as sinus congestion, wheezing, difficulty breathing, coughing and chest pain. Your skin can become itchy, inflamed and swell, resulting from hives and eczema. Lightheadedness, fainting and dizziness can all develop from effects on your cardiovascular system, according to FamilyDoctor.org. Is a Red Rash on the Cheeks a Sign of a Food Allergy? What Kind of Foods Can Cause Body Itching?